It's 75 years since the Blitz bombing raid that came to be known as the Second Great Fire of London. Over the night of 29-30 December 1940, around 100,000 bombs fell in the space of a few hours, causing fires that raged over an area greater than the famous 1666 blaze — and was far more deadly. German bomber planes were mainly carrying incendiary bombs that night. These bombs are relatively small (about 12in by 3in) and packed with magnesium, intended not to destroy on impact but to start fires. Each bomber could carry around 180 bombs, and about 1,500 fires sprang up as a result. 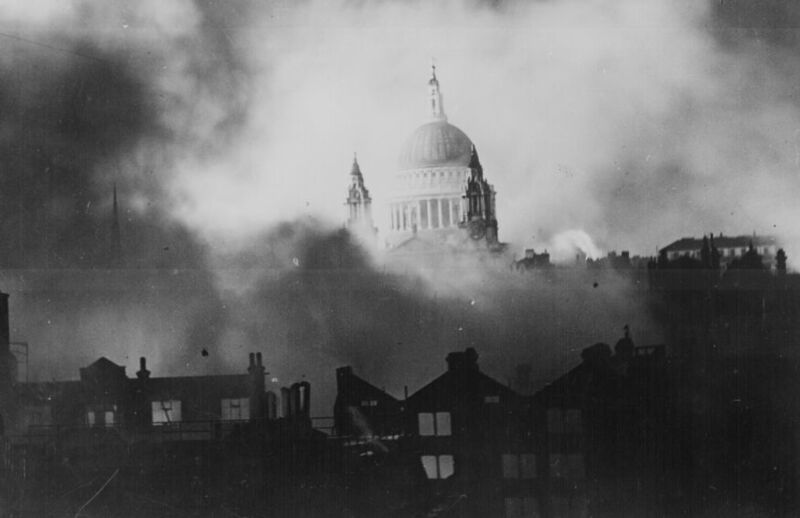 28 incendiary bombs landed on St Paul's, one punching its way through the lead outer roof of the dome causing concern that it would set alight the inner wooden structure. Luckily, the bomb melted the lead that was holding it in place and fell onto the Stone Gallery, where it was swiftly put out. The area around the cathedral, however, was completely burned out. Other famous City buildings weren't so lucky. The Guildhall's Great Hall was destroyed and several Livery company buildings were damaged or destroyed, including Saddlers' Hall. 17 City churches were damaged — only eight of which were rebuilt. The steeple at St Bride's caught fire, the bells falling from their housing and smashing on the floor below. Many homes, offices, factories and pubs were destroyed. Some residents and workers were away for Christmas which meant the human toll wasn't as heavy as it could have been — though still, 163 people were killed and 503 injured — yet it did mean fewer hands available to help fight fires. Another problem facing firefighters was a lack of water. The primary water main in the City was bombed and there were so many appliances tapping into other water pipes that water pressure failed. Adding to the difficulties was a low tide, so even the Thames wasn't much help as hoses filled with foreshore mud. Of the casualties, 12 of those killed were firefighters and 250 added to the injured. And believe it or not, it all could have been so much worse. A follow-up wave of bombers carrying high explosives was cancelled because of poor weather. If you'd like to mark the occasion, we recommend raising a toast in the Blackfriar pub (one of the finest pubs to have survived the conflagration) or going along to St Paul's and Dowgate Fire Station on 29 December, where the Massey Shaw fireboat will be pumping water, and other vintage fire appliances will be on display. An air raid siren will sound at 6.05pm. We're indebted to the book The City Ablaze: The Second Great Fire of London by David Johnson, and a post by A London Inheritance for much of the information in this article.